Each year, make sure you help celebrate National Women in Engineering Day (NWED) to support women engineers and girls in STEM alongside leading employers like AECOM, Thales, Arup, University of Sheffield, Schneider Electric and more. 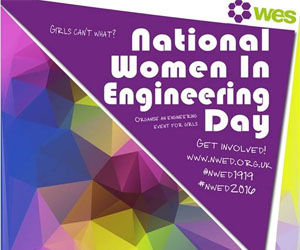 National Women in Engineering Day (NWED) sees lots of great news, information and events - all aimed at celebrating the achievements of women in engineering - and of course inspiring future generations of girls in STEM. Remember you can download amazing NWED resources from the Women's Engineering Socity (WES).